Note to readers: This is a special preview of what will be a regular Sunday feature in The Times, Art Watch, written by Lele Galer, a noted local artist herself and Unionville resident. 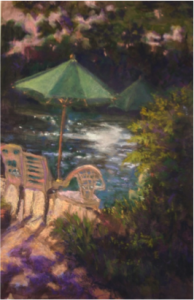 Her pastel work primarily focuses on colorful explorations of picturesque local pastoral scenes. Occasionally her images are derived from her extensive travels throughout Europe. After viewing the Metropolitan Museum’s exhibit on Van Gogh in St. Remy and Auvers, Denise was determined to get to those small towns in France and explore the world Van Gogh lived in. Denise says St. Remy “felt like a holy place and seeing the views that he painted was really inspiring.” In the “St. 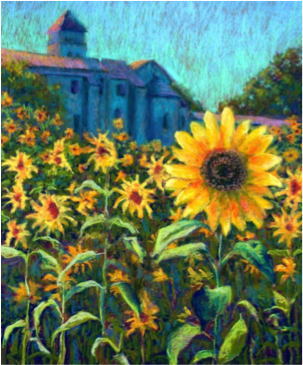 Remy Sunflowers” image from France, Denise’s bright field of yellow-gold sunflowers are set against a juxtaposing backdrop of purple-blue asylum buildings. The heavy handling of the sky flattens out the image, in the style of the impressionists, and makes our eyes explore the more decorative elements of the compositions as opposed to the three-dimensionality of the scene. Her color choices are more pronounced than the Impressionists’ palette (more in line with the color choices of Bonnard than Monet ). The images are pleasant to look at and have an overall feeling of tranquility. 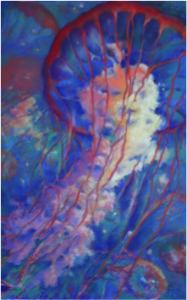 She is inspired by “light and shadow and the color that exists in the light and shadow…” Her use of bright secondary color as it combines with shadow is what separates her work from a more straight forward academic approach, (as in the case of the “Green Umbrella by the Pool”) but her work is clearly rooted in academic tradition. Denise has a Master’s degree in Fine Arts in Illustration as well as a Master’s degree in Fine Arts Education, and has taught in many schools all over the country for the past 25 years. She continues to take classes and teach classes at the college and graduate level, and currently chooses to work primarily outside–“en plein air”– to capture the colors and shadows of her subject matter in true light. This is the first in a series of weekly articles that will highight one local artist every week. Lele Galer is an artist who has chaired numerous art shows, taught art history and studio art, public art and has chaired, written and taught the Art in Action Art Appreciation series for the UCFSD schools for the past 12 years. She worked at the Metropolitan Museum of Art, and wrote for the Associated Press in Rome. She has been dedicated to Art History and art education for most of her adult life. Lele and her husband Brad own Galer Estate Winery in Kennett Square and she is President of the Unionville Chadds-Ford Education Foundation.